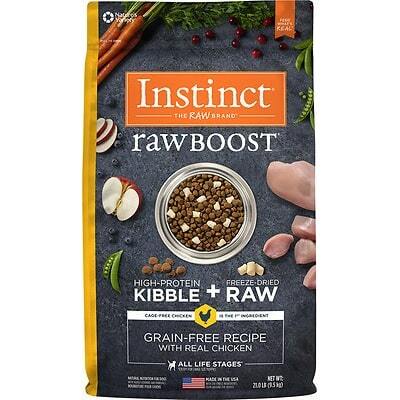 Instinct Original Grain-Free Recipe is a mid-priced dog food with great quality. This product has no controversial ingredients, including zero artificial preservatives, colors and flavors - that’s fantastic. It has very well-balanced amounts of protein, fat and carbs, with an excellent quality of meat and fat. 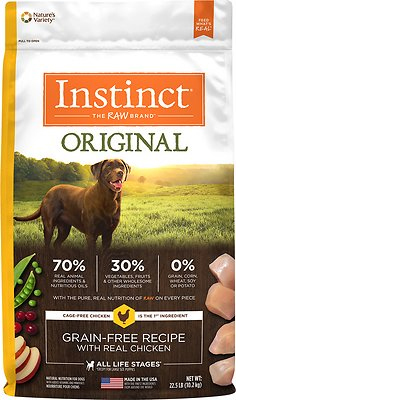 Be aware that Instinct has an above-average number of dog food recalls, and the company was extremely transparent when answering our questions. Watchdog Labs recommends this product. The average dog food we reviewed has 39 total ingredients, with 1 controversial ingredient. Instinct by Nature's Variety Original Grain-Free Recipe has 0 controversial ingredients. Instinct by Nature's Variety Original Grain-Free Recipe has no controversial ingredients, so nothing to report here. 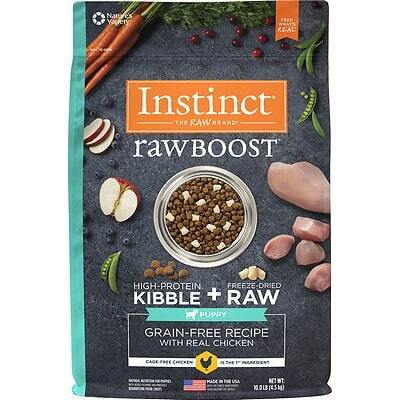 Instinct by Nature's Variety Original Grain-Free Recipe is manufactured in the USA. It’s always a good thing, because the United States has strong dog food quality standards in place, compared to many other countries. Chicken, Turkey Meal, Chicken Meal, Chicken Fat (preserved with Mixed Tocopherols and Citric Acid), Salmon Meal, Chicken Eggs, and Menhaden Fish Meal are the main protein and fat sources in this dog food. All of them clearly show you which animal they come from, making the ingredients very transparent and high-quality. This product contains zero controversial preservatives on the ingredients list, that’s fantastic. It’s good to know that ‍not all artificial preservatives are bad. That’s because they serve an important purpose, which is to prevent food from spoiling. However, we consider 11 artificial preservatives controversial because of their potential link to cancer and other serious health conditions. Instinct by Nature's Variety Original Grain-Free Recipe skips the artificial colors as well. That’s a big plus. No preservatives, no colors, and no artificial flavors either. This food shines in all three areas equally, really great. Nature's Variety has an above average number of total recalls, compared to other dog food brands. Instinct answered in two days with a great response. All questions were fully answered with no follow-up emails required. There were few companies that answered this clearly and quickly. Its great to see this level of transparency on the first email response. Knowing exactly who the individuals are working on the food we feed our dogs is insightful. Pet health and safety has always been our top priority. We believe your pets – and ours – deserve nothing less than superior quality foods. With all of our products, we utilize robust systems to ensure the quality and safety of our foods. Our quality control and quality assurance programs include but are not limited to: Sanitation Standard Operating Procedures (SSOP’s), Good Manufacturing Practices (GMP’s), A Hazard Analysis & Critical Control Points (HACCP) Program, Lot Segregation, other human food industry best practices, and High Pressure Processing (HPP). At every point in the process – from raw material receiving to finished product – there are quality steps and check points. Raw materials and finished products are routinely tested. The manufacturing plant and any warehouses where the product is stored are also inspected on a routine basis. We are confident that we produce high quality, safe products. Please be assured, Nature's Variety has and will continue to enforce only the strictest quality standards in the pet food industry.